There are many great vineyards in Spain, especially in La Rioja, one of the oldest and most famous bodegas is Marques De Riscal. Located just 6 km from the small town of Laguardia, it comes highly recommended as a stop on any trip through this region of Spain. With a tour booked at 10:30 am (I love getting the day started the right way! ), we decided to spend a night in a hotel nearby. 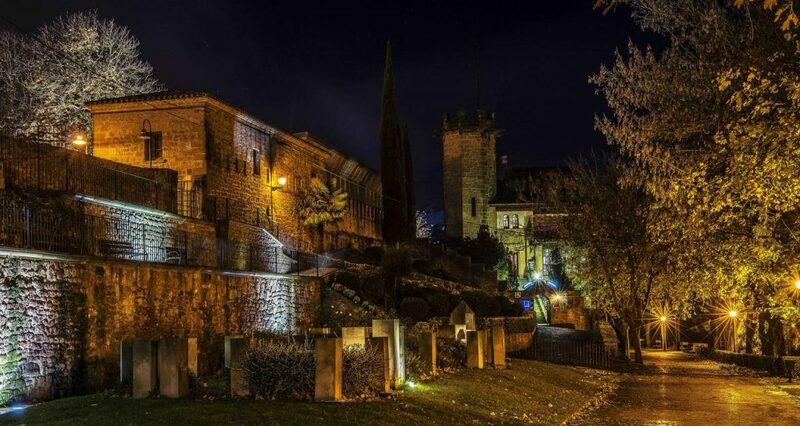 There are a few options when looking at where to stay in La Rioja, many vineyards have their own hotels. 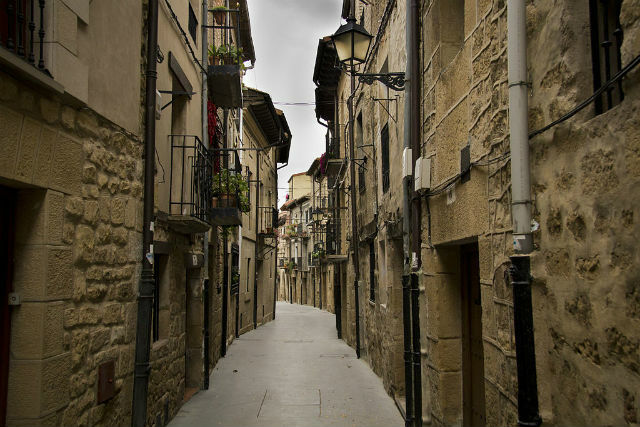 but you’ll find most of the accommodation is based in and around the region’s capital Logroño. 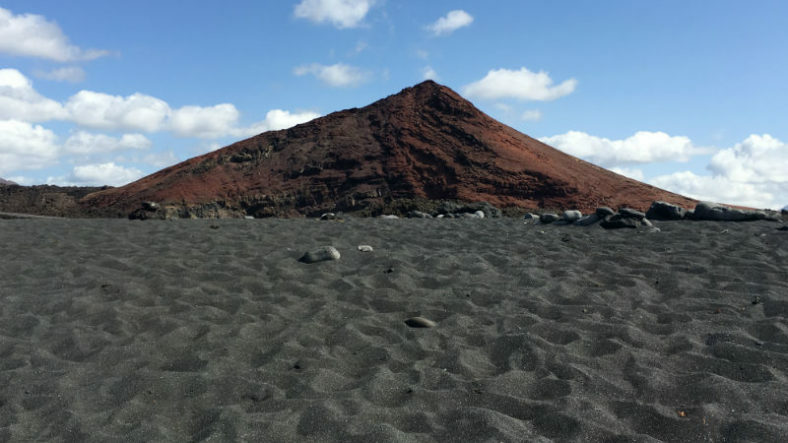 For this visit, we opted for the small town on Laguardia, and we were not disappointed. Felling lazy? Skip to what you are looking for! Where is Marques de Riscal Vineyard? Why is Rioja wine often in a wire mesh? We were celebrating a special occasion (I won’t bore you with the details) but as a result, I decided to splash out a little more than I usually would and stayed at the boutique hotel Castillo El Collado (€119). The building dates from the 19th century and is constructed on the site of a 12th-century fort complete with an imposing tower as a symbolic nod to the past. As soon as we walked in it felt as if we had stepped back in history, the dark wooden staircase, stone walls, and impressive artworks; welcoming, yet slightly intimidating. However, as we entered our room, all that faded away. Each of the ten rooms is individually decorated; ours felt warm and romantic with wooden panelling on the walls, a fireplace, bed big enough for a whole family and a luxurious Romanesque bathroom with a tub big enough to sink the Titanic (though not the iceberg). Oh, I haven’t mentioned the complimentary bottle of wine that all guests also receive! 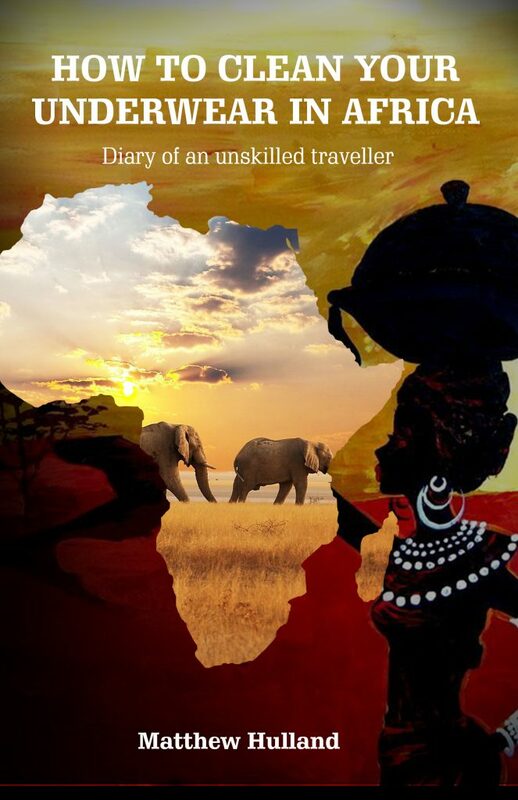 After a glass of red, we set out to discover more. We didn’t have to go very far; the hotel allows guests to ascend to the top of the tower. The wooden staircase creaked beneath our feet as we circled our way to the top of the tower. Old bottles of wine are displayed on the wall as a reminder of where you were . . . in case you’d forgotten that you were in the centre of one of Spain’s most famous wine regions. As we emerged onto the roof of the tower we were greeted by the sight of the Obarenes-Sierra de Cantabria mountains running along the horizon to the north, their exposed rock faces glimmering in the sunlight as if capped in snow. In every other direction were expanses of vineyards, flowing to the horizon as far as the eye can see. When I travel places I always love to find the highest viewpoint and take it all in so this was a bonus. However, as usual, something happens to dent the moment, this time, it was my inability to remember to charge any of my camera devices leaving me unable to capture the view – this one will have to be left as a memory. 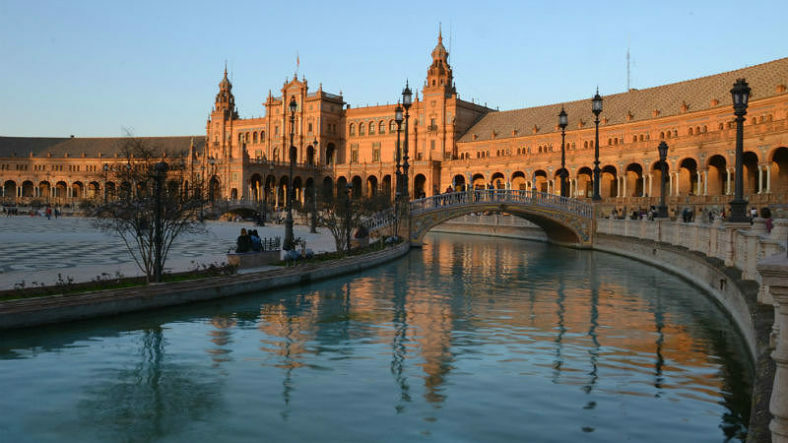 As we headed away from the hotel, we took a walk in the surrounding gardens (free to access) and onto the thin streets enclosed by towering facades. Although all the shops were closed by the time we arrived, there were many bars open serving pinchos and tapas, of course, accompanied by the local wine at excellent prices – 70 cents for a glass in some places! 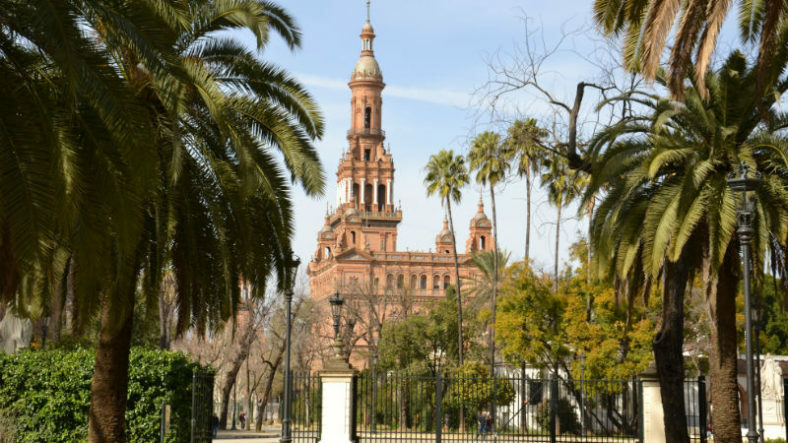 Laguardia is a charming, peaceful place that is ideal for exploring the region and we loved it, however, if you’re after a little more life in the evenings, Logroño would be a better place to stay. As for the hotel itself, I wholeheartedly recommend it as a place to stay, I didn’t see any other rooms, but ours was amazing, and the staff were fantastic. The next morning we headed to the vineyard in the small village of Elciego. When looking for vineyards to visit I generally try to do tours of smaller producers as I feel they offer a more personal experience. You can discover some real gems while supporting local small businesses. However, as in a previous period of my life, when I worked in hotels and restaurants, we used to stock the Marques de Riscal Reserva (and was one of my faves) I thought a chance to visit the vineyard was too good to pass up. It took less than 10 minutes to get there, even after navigating a tricky roundabout where a signpost pointed us in completely the wrong direction. It’s hard to miss the vineyard; the horizon is dominated by two features, the village’s dual-towered church, the Parroquia San Andrés Apóstol and the contrastingly modern titanium roof of the new hotel at the Marques De Riscal Bodegas. As with many modern designs, I’m sure the striking style has attracted much praise, and as many insults, personally I love it. Designed by Frank Gehry, the same architect that created Bilbao’s Guggenheim Museum, the roof reflects the sun with a mixture of pink, gold and silver hues. We were later to find out the reason for this. We parked the car and headed straight to the visitor centre to check in for our tour (advanced booking is highly recommended). The shop sells a myriad of local arts and crafts as well as all of their wine and a rather nice café alongside serving local tapas and a good selection of their wines by the glass. It offers an opportunity to try some of the higher end ones without having to splash out on a whole bottle. The tour itself was very enjoyable. I have been on many vineyard tours in my time, and this definitely ranks alongside the best if you have a genuine interest in wine. It began with a short video detailing the history of the brand (don’t worry, everything was conducted in English!) before our guide led us to a vineyard with fantastic views of the architecture and we were even invited to try some of the Cabernet Sauvignon grapes straight from the vine. They were surprisingly sweet! 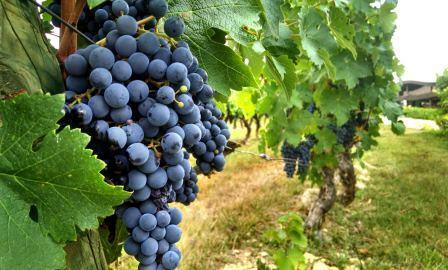 Cabernet Sauvignon grapes grow and we were invited to try the. … which we did! We were lucky as we probably visited at the best time (October) when the harvest was in full flow and the vineyard thriving with life. 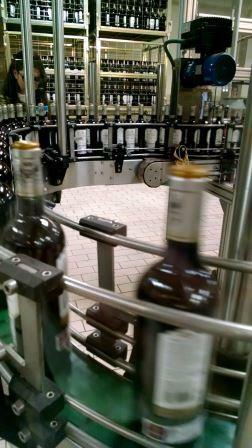 The guide explained the process of making the wine before taking us into the cellars and finally the bottling room. Why the wire mesh on Rioja wine? To see the production on such a scale is somewhat mind-numbing. I found the machine that puts the wire mesh around the bottles particular fascinating. Now just a part of tradition – and an annoyance to bar staff everywhere when trying to remove it in a hurry – the mesh was originally designed an antifraud device. The story goes that as their wine was one of the better ones, bars would sometimes simply refill the Marques De Riscal bottles with cheap plonk and sell it again. The mesh was there as a customer guarantee, so they know they are getting the real product. What stood out most from that room was the noise. In my old industry whenever I heard bottles clunking together like that it sent a shiver down the spine as I waited for the inevitable follow-up smashing of glass. Here it never comes, but the noise still puts me on edge! Before we headed for the bit everyone was there for (the tasting) we had one last highlight – the bottle room. 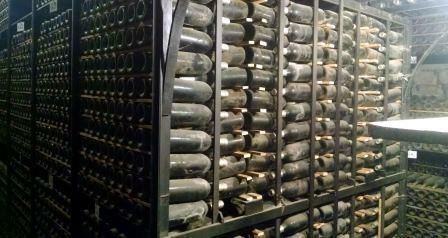 It is in this cellar that the vineyard has kept bottles of every vintage dating back to the very first run in 1863. They keep up to 3000 bottles depending on how good they feel the vintage was in that year. When VIP’s visit the vineyard, they will still open a bottle for them. For example, when celebrating the opening of the hotel with Mr. Gehry, they were able to enjoy a bottle of 1928 vintage with him – the year of his birth. Sadly I didn’t make the list. The stunning cellar … so much wine! As we concluded the tour, we headed to a room set up for tasting enjoying one white and one red with a group discussion encouraged. As usual with these tours that gather up groups of strangers, most people seemed reserved and wouldn’t speak out loud for fear of embarrassing themselves . . . Myself included. As the final sip of the 2012 Reserva slid down my throat, that was the end of the tour, and we re-entered the visitor centre as the next group was heading out to start their journey. We did stay for a bit longer after the tour. As mentioned earlier I took the opportunity to enjoy a glass of Baron de Chirel 2011, which retails at over €50 a bottle with some local chorizo and croquettes. A delicious finish to the tour. If you find yourself in La Rioja, I would happily recommend a tour of the Marques De Riscal vineyard. Whether you’re just discovering the world of wine or an old hack, you’ll be sure to find something about it to enjoy. As for that roof which shines pink, silver, and gold . . . Pink as the colour of the wine, silver like the caps of the bottles and golden to represent the iconic wire mesh of the Marques De Riscal brand. Loved ur article. Almost felt I was in a vineyard doing the tour. Great read and pics ? I hope you enjoyed your special celebration, looks like it was worth the splurge! I loved seeing the wine-making process! Very cool. I don’t drink but your post was informative. Thanks for sharing! I can only hope that one day I’ll get to visit. Sounds like an amazing place. I’m a wino so definitely a bucket list item. I love visiting vineyards, there is something special about them. Wine makes me so drunk!! I’d embarrass myself for sure haha! I would love to see the wine making process though. If I ever find myself there, I will follow your advice and pay a visit. This looks awesome. The only problem for me is that I’ve become allergic to wine!!! I would still be interested in finding out the process though. I bet you had loads of fun! Wow! 70 cents for a glass of wine! That’s pretty awesome. 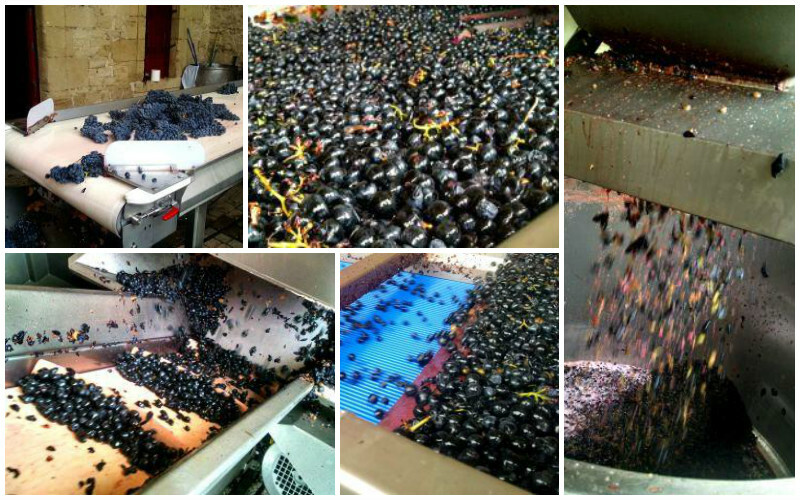 The whole process of making wine- thought I’d see people stomping the grapes in a big tub- just kidding;) Looks like I better try a Spanish wine sometime soon. The design of the roof is very interesting. Moreover it’s pink! I’m sure the vineyard tour would have been quite a great adventure ??? I’ve also been on a few vineyard tours. Funny enough, I have a similar picture of the one you have where the grapes are going through the machine. I love those dusty old bottles of wine in the cellar. Gives it a historical feel and I love history. Wine tasting in Spain is a dream, and doing so at Marques de Riscal sounds like it would be perfect. The buildings roofing looks incredible, as does the food! It’s easier than you may think. 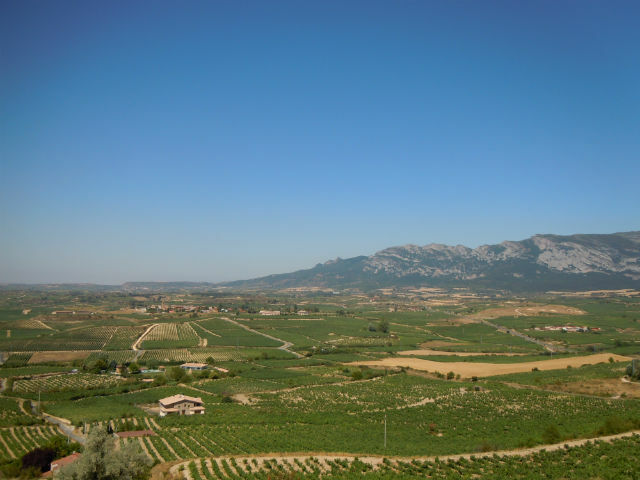 Rioja is not the easiest to get to if you’re pushed for time but there are plenty of vineyards withing an hour of Madrid and Barcelona, some you can even reach by public transport! 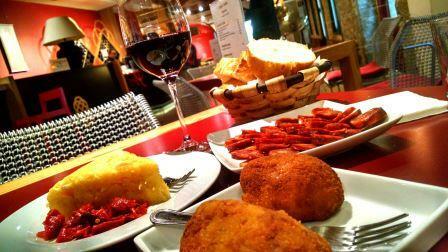 I would say here that I love Spanish wine, but it would be better to point out I love wine. If you like red then I’d recommend a Rioja or Ribero De Duero, they are great examples of classic Spanish style If you’re more into white then you should try Albarino when you get a chance, it’s delicious! Ooh you can’t get a better day out than a good old wine tasting. There aren’t many in the UK so I have to take the chance whenever I’m abroad! This one looks like a particularly good winery to visit. I like the roof of the building – it’s very eye catching! 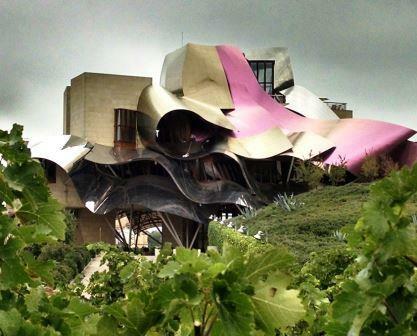 The Bilbao’s Guggenheim Museum next to the wine fields looks so hillarious, so surrealistic! I would love to experience the process of wine making one day. It must be a great adventure. It is a bit strange, everything else is so traditional then you get that hunk of metal! I like it though. I absolutely love exploring vineyards while traveling. This one looks amazing – especially with that unique architecture. Some of my favorites have been in South Africa and on Waiheke Island in New Zealand. Such beautiful places! I have a passion for wine . . . well . . . any local drink really. 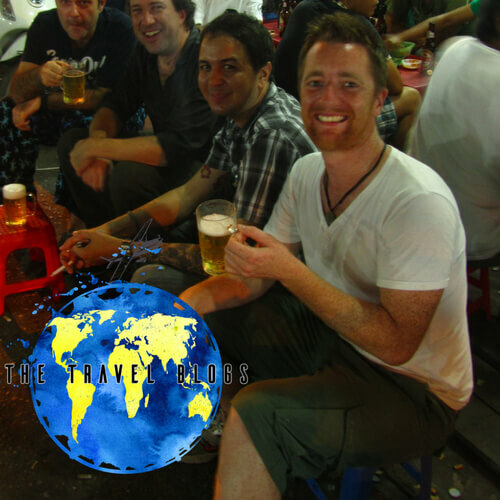 Drink has played such a huge role in the development of culture. I haven’t been to SA yet but I want to do the Garden route and visit the vineyards of the West. New Zealand I also loved! A really interesting piece. What’s your favourite wine? I tend to prefer Italian to Spanish wine but my dad would love this! Ohhh, favourite, that’s a tricky one. At the moment I love Albariño from the North West of Spain in Galicia but there are so many I am yet to discover! Italian is also good, I like the ones from the heel, Primitivo and Salice Salentino. Basically I like everything! The vineyard visit itself isn’t too bad but the hotel is super expensive, but it’s luxury. There are cheaper places to stay. It’s a really nice place to visit, La Guardia is a lovely small town and it’s not too far from Bugos which has an amazing cathedral. Anyway, hopefully you get there someday. It’s definitely unique, especially in the traditional wine industry. I think I really like the roof! At the very least, it’s interesting ? We are spoilt for choice here in South Australia for wineries to visit, but that means I enjoy going to them. I will definitely be doing some tastings when I get to Spain. 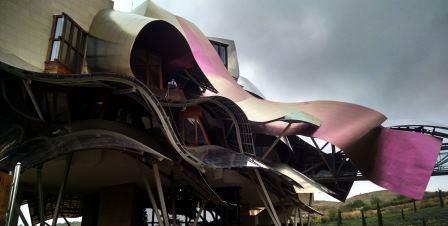 I agree the roof is pretty cool, really stands out in the Rioja region. I loved visiting in the Clare Valley when in Australia, Mr Mick and Skillogalee in particular! It’s different in Spain to Australia, a little less organised and often a lot more expensive, but well worth doing.